The Great Recession is not done with us yet. While the most acute part of the economic crisis is past, the recession's most significant impact on American life still lies in the future. The personal, social, and cultural changes that result from severe economic shocks build and manifest themselves only slowly. But history shows us that, ultimately, shocks this severe profoundly alter the character of society. 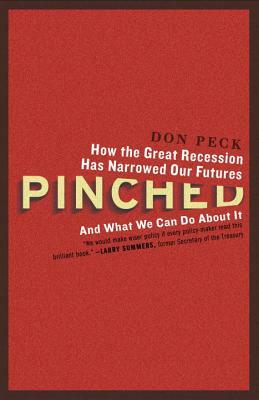 Don Peck’s Pinched, a fascinating and harrowing exploration of our dramatic economic climate, keenly observes how the recession has changed the places we live, the work we do, and even who we are—and details the transformations that are yet to come. Every class and every generation will be affected: newly minted college graduates, blue-collar men, affluent professionals, exurban families, elite financiers, inner city youth, middle-class retirees. This was not an ordinary recession, and ordinary responses will not fully end it. The crash has shifted the course of the economy. In its aftermath, the middle class is shrinking faster, wealth is becoming more concentrated, twenty-somethings are sinking, and working-class families and communities are changing in unsavory ways. We sit today between two eras, buffeted, anxious, and uncertain of the future. Through vivid reporting and lucid argument, Peck helps us make sense of how our society has changed, and why so many people are still struggling. The answers to these questions reveal a new way forward for America. The country has endured periods like this one before, and has emerged all the stronger from them; adaptation and reinvention have been perhaps the nation’s best and most enduring traits. The time is ripe for another such reinvention. Pinched lays out the principles and public actions that can help us pull it off. Don Peck is a Deputy Managing Editor at the Atlantic, where he has worked as an editor for six years. He covers economics and culture, among other subjects, and commissions many of the magazine’s feature stories. Before he became a journalist, Mr. Peck was a principal at the Advisory Board Company, a large strategic research firm and management consultancy. He has a B.A. in government modified with economics from Dartmouth College and a Masters of Public Affairs with a focus on international development from the Woodrow Wilson School at Princeton University. He lives with his wife Meghan in Washington, DC.